Kirkcudbright Tolbooth is located at the corner of the High Street. It is now the Tolbooth Art Centre, and is open to the public. For details of opening times, visit the centre's website. 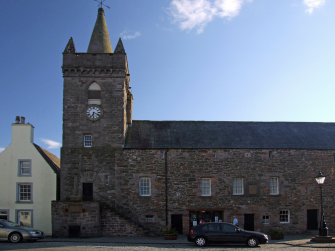 During the Covenanting period, Kirkcudbright Tolbooth was used as a place of imprisonment. The building was erected 1625-29 as the tolbooth, perhaps incorporating an older building, described as ‘ruinous’, and incorporated council meeting room, burgh and sheriff court and prison. In 1993 the building was converted into an art centre and opened by the Queen. The number of Covenanters held in the jail is unknown, and we only get snippets from various accounts. However, it is known that John Neilson of Corsock was held in the tolbooth for a time, having been arrested for allowing a number of ministers to preach in his home. He was fined £2,000 Scots. He was later executed in Edinburgh on 14 December 1666. On 16 December 1684 a number of Covenanters attacked the tolbooth where other Covenanters were held prisoner. All of them were released. During the attack, a guard was killed by the Covenanters, one of the few times when the Covenanters were guilty of killing others. John Graham of Claverhouse subsequently set off in pursuit of those responsible and captured a number of Covenanters involved at Auchencloy a few days later. Taken at Auchencloy and held in the tolbooth prior to trial were William Hunter and Robert Smith. Their grave is in Kirkcudbright cemetery.